God, Charlton and Punk Rock: All I want for Christmas is 3 points Boxing Day! All I want for Christmas is 3 points Boxing Day! 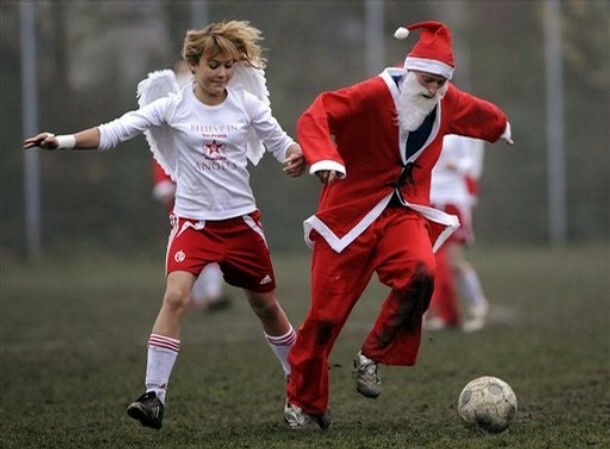 I can only see one down side to being a professional footballer and that's working, or more to the point training, on Christmas morning. I've never managed to ask a player their thoughts on this particular mornings work but i presume it's a monotonous task seeming all the more sluggish when on the back of two long distance away defeats. Both Bolton Wanderers and Sheffield Wednesday have beaten us by a two nothing scoreline over the past two Saturdays, our league position slipping dramatically in the process. After just getting our noses into the top half of the table we find ourselves back down in eighteenth, eight points from safety. Many would have predicted a defeat to relegated Bolton, but the Wednesday result is a much harder pill to swallow. The Llera and Semedo factor, the rivalry from last season, the fact they also have been a club that has a glorious past yet has been in the doldrums of the third division for too long, you can find similarities everywhere. Quite simply, and I don't mean to offend, they are relegation fodder who I expect to be scrapping for their lives in a dog fight come the Spring. A point would have been a very realistic expectation here. We have a phrase for yesterday, 'typical Charlton'. A lot has been said over the past week or so about being the better side for the majority of the game, losing out to wonder strikes, poor refereeing decisions and penalties that should have been awarded. The fact that we haven't taken chances as they've come along frankly hits the nail far more firmly on the head. We can blame the opposition, the officials or even each other until we are blue in the face, the reality of the matter is we haven't got the ball in the net (legally) at any point over those three hours of football. I'm not stupid enough to link this to Rob Hulse being dropped to the bench for the returning Yann Kermorgant, no matter what my personal preferences, or the constant meddling with the starting eleven. I'm also not stupid enough to get on the Chris Powell isn't good enough bandwagon. I believe we have a very bright young manager that has a lot of potential. He isn't a great manager by any stretch of the imagination but he does have the ability to become one. The art of the perfect tactical substitution will come! I doubt very much that Brian Clough ever had a softly softly approach on Christmas morning putting his players through their paces just as hard as he would any other day. I hope Chris Powell does the same. If needs be those players need to walk back to the showers on Tuesday thinking the gaffer is a complete b*****d if it means three points against Ipswich on Boxing Day. Ipswich have started to turn things around of late with a couple of wins away from home plus a drubbing earlier this month of in form Millwall at Portman Road. Certainly no push over and with the arrival of Derby on Saturday followed by a trip to Watford New Years Day, points over this festive season are going to be hard to come by. It's not all doom and gloom though, we are still only eight points of the last play off spot and I still firmly believe this squad, under this management is more than capable of a top half finish. I would quite happily have taken this position at the beginning of the season as would any Charlton fan with a modicum of common sense. Christmas is the half way stage and we've already shown on numerous occasions that we have the grit and the ability to carve out a future for ourselves at this level for a lot longer yet. The January sales will begin soon, I very much doubt we'll be bringing new names in although those unsettled amongst our ranks could very well be off to pastures new leaving a more content squad to secure our safety. You forget how many footballers will pack the whole house and family up with the Christmas tree! Have a great Christmas folks, let's round this year off with some loud vocal support at The Valley and in return Chris Powell's red and white army may well give us the one thing we all want for Christmas, a Charlton win!